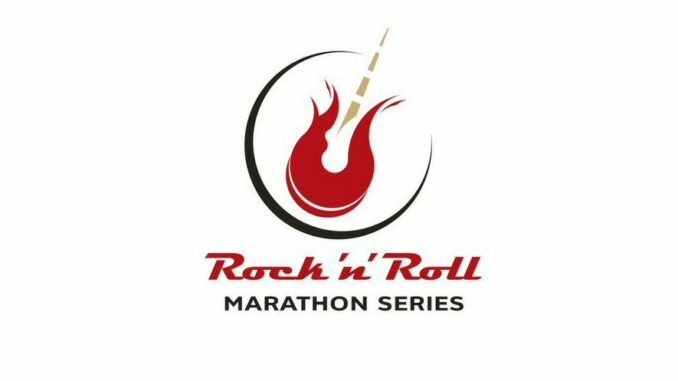 It’s an annual tradition with a new name as the St. Jude Rock ‘n’ Roll Nashville Marathon & 1/2 Marathon (formerly St. Jude Country Music Marathon & 1/2 Marathon) gets ready for over 30,000 participants to descend on the downtown and run wild in Music City. 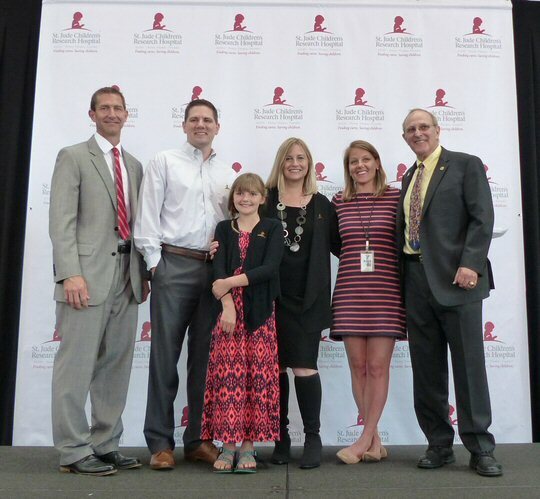 On April 28, 2016 Mayor Megan Barry joined a host of dignitaries from the St. Jude Children’s Hospital and Competitor Group, Inc. – the organizer of the athletic series – to officially set the 17th year of the event in motion. Nashville Mayor Megan Barry Helps Marathon Weekend get off to a running start at Music City Center. Emcee Dan Cruz, VP of Public Relations for the Competitor Group greeted the meeting and racers. He thanked the amazing partnerships in Nashville for their support in making this one of the most anticipated events on the spring calendar. He cited the fact that over the history of the race runners have helped raise more than $26.1 million dollars for a variety of causes including St. Jude Children’s Research Hospital. The 2016 St. Jude Rock ‘n’ Roll Nashville Marathon & 1/2 Marathon course map. 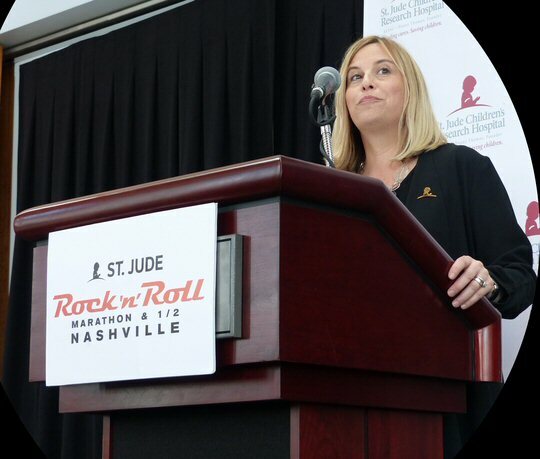 Mayor Barry was next describing how Nashville is on the path to becoming a fit city and relayed how she is dedicated to providing fun opportunities for city residents to reach their own personal fitness goals. She cited the economic impact the race weekend generates remarking that according to an economic impact study last year’s event generated $44.3 million for the local community as 70% of all participants traveled from outside of Music City to take part in the event – filling hotel rooms and dining in the city’s culinary marketplace. Remarkably, of the 36,000 visiting in 2015 over 65 percent were women from all 50 states and 26 countries. Chris Boysen, Marshall and Audrey Stanger, Mayor Megan Barry, Alley Pickren and Tracy Sundlun kick things off at Music City Center. Tracy Sundlun, Vice President and Co-Founder for the Competitor Group, informed listeners that the name change has created a more inclusive event and that participant numbers are back up to over 30,000 for the first time in four years. Upon conclusion of the press conference the doors to the Health & Fitness Expo opened at Music City Center revealing an expansive showcase of apparel, physical activities, running equipment and dozens of vendors. Our favorites were Sports Beans for their high energy jelly beans, Zipfizz energy hydration powdered drink mix, and SportsHooks.com for their cool product line. 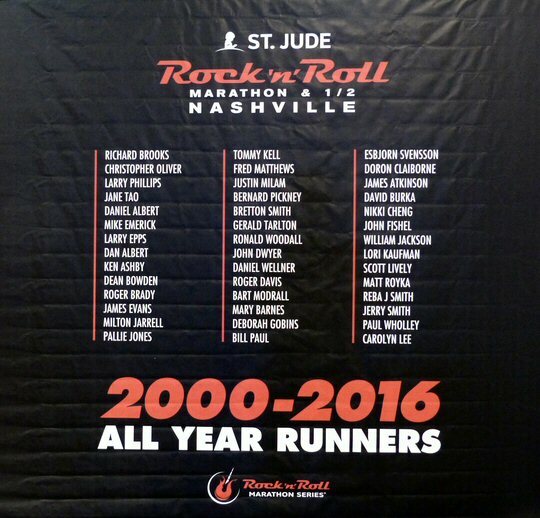 This banner shows runners who have taken part in all 17 years of the Nashville Marathon and 1/2 Marathon. Finally, it wouldn’t be a Music City happening without the music. Kicking off the celebration at the press conference was a capable husband and wife duo called Blue Honey (bluehoneymusic.com) who displayed their ample talent with a nice mix of covers and originals. If that wasn’t enough to satisfy your musical taste runners will be treated to audio adrenaline and encouragement from over 50 bands who will dot the 26.2 mile course. A grand celebration will be hosted by rock legends The Wallflowers who will headline the Toyota Rock ‘n’ Roll Concert Series at Bridgestone Arena on the night of the Marathon. For more information or to register for the event, visit RunRocknRoll.com/Nashville and follow the marathon on Twitter @RunRocknRoll with the hashtag #RnRNashville. 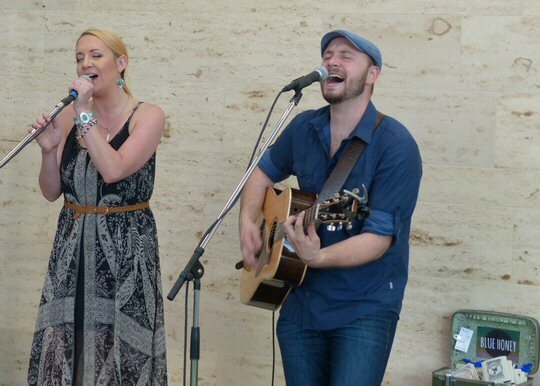 The band Blue Honey performs at Music City Center in Nashville.